The Society of Friends (Quakers) began in England in the 1650s, when they broke away from the Puritans. Pennsylvania was founded by William Penn, as a safe place for Friends to live and practice their faith. Hopewell Friends Meeting was set off from the Concord, Pennsylvania Quarterly Meeting in 1734. It was originally named Opeckan after nearby Opequon Creek. The first log meeting house was built in 1734 and was about six miles north of Winchester, Virginia. At various times there were about 30 meetings under its over­sight. These meetings covered a large area including all of northern Virginia, and all of what is now West Virginia, parts of western Pennsylvania and one meeting in Maryland (Monocacy). About 1736, the members asked Chester quarterly meeting for permission to hold a monthly meeting. In 1757, the Hopewell meeting house burned and the early records were lost. This meeting Appoints William Pickering, Enos Ellis, Samuel Pickering, John Lupton, Joseph Lupton, and Benjamin Thornbrugh to meet the Committee from the Quarterly Meeting to meet at pipe Creek in Maryland the 23d of the 10th mo. to Confer With them Conserning Holding of A Quarterly meeting and make Report to the Next monthly meeting. 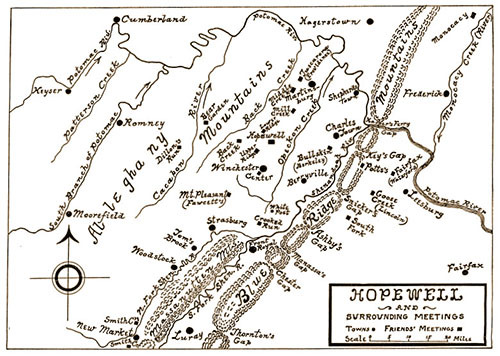 In 1781, Hopewell Meeting split into Crooked Run and Centre Meetings. Crooked Run Meeting was in Warren County, Virginia near the village of Ninevah. Opequon Creek is tributary of the Potomac River. It joins the Potomac northeast of Martinsburg and its source is at the foot of Great North Mountain. It is part of the boundary between Frederick and Clarke counties in Virginia and between Berkeley and Jefferson counties in West Virginia.